Converted 5 Gallon Ball Lock Corny Keg NOTE: DUE TO THE RAPIDLY DECREASING SUPPLY OF USED KEGS, PRICES HAVE RAISED. GET THEM WHILE THEY ARE STILL AVILABLE. This is a "converted ball lock corny keg", which means this keg is converted from being a pin lock corny keg, to having ball lock posts! 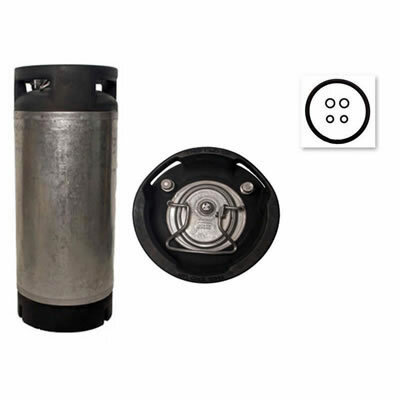 This keg has the olf style pin lock lid, that does not have the pull style pressure releif valve. Perfect for those that need the shorter height of the pin lock keg (22") but prefer ball lock connections. This corny keg, like all our others, has been cleaned and rinsed in a 3 step process. Keg may have dings, scratches and stickers. We guarantee your satisfaction with this keg!